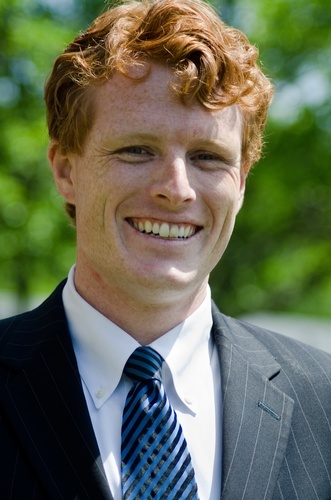 Tues. Nov. 13, 7:30-9:30 a.m.
Buffet Breakfast at 7:30 a.m.
United States Congressman Joseph P. Kennedy III will be the featured speaker at the Newton-Needham Regional Chamber's Fall Business Breakfast on Nov. 13 at the Newton Marriott Hotel. The Fall Business Breakfast, presented by Needham Bank, is the region’s largest annual gathering of business professionals, civic and community leaders, drawing more than 500 attendees from across multiple industries and communities. "We're extremely pleased to have Congressman Kennedy join us at this year's breakfast, which is occurring one week after this year's mid-term elections," said Chamber President Greg Reibman. "I think we all know that no matter what happens on election day, it will be interesting to hear the congressman's reflections"
Latoyia Edwards, an Emmy Award-winning news anchor on NBC10 Boston and NECN will serve as the event’s emcee. A Boston native, Edwards joined the NBC Boston and NECN as a morning reporter in 2005, arriving from WWLP-22 in Springfield, Massachusetts, where she had been a weekday anchor. Every year the chamber’s executive committee recognizes a member with presentation of the RL Tennant Award, the organization’s highest honor. This year the chamber will be honoring its long-time treasurer Walter F. Tennant for his decades of service to the business community. Mayor Ruthanne Fuller, Needham Select Chair Dan Matthews and others guests will be speaking and two local students will be presented Young Entrepreneur Awards. Buffet breakfast will be served at 7:30 a.m. The program begins at 8 a.m.